The integrated passenger terminal building measuring approximately 10lakh sq. feet, is basically at 3 levels: Basement level, Arrival level and Departure level with fly over of 750 m in length. It is one of the most modern facilities, which is unique of its kind the “Swing Facility”, which means terminal could be either operated as a domestic terminal or international or both, because of the presence of sliding glass partitions in between. The terminal is equipped with self-check in counters and self-baggage dropping machines. The integrated terminal building could be expanded into modular fashion where an average of 1 sq.km of land is available for future expansion. 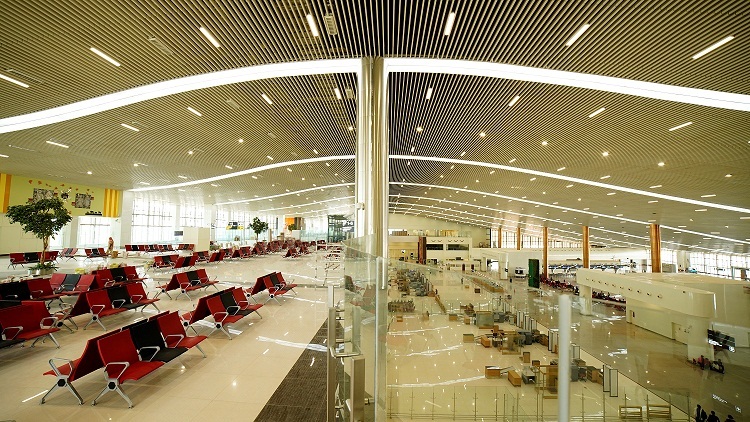 It has Green LEED certification as Green Building concept is adopted in the design of the terminal building. The terminal building has been equipped with retail outlets, food and beverage outlets, duty free shops (to be commissioned shortly), money exchange counters and international lounges along with VIP lounges. The peak hour passenger capacity is 2000 including both international and domestic.